With this pallet furniture you can use your wooden pallets to give a nice finish to your lounge and take a nap those Sunday afternoons …. Does not sound great? Yes! So at least it will take a mattress. The truth is you do not have to do so much, just put some of the pallets together to make a frame for a decent sofabed. If you already have made ​​the bed frame, but it lacks of any grace, consider painting or staining some pallets, and nail them to the wall to make a custom header. How to disassemble the pallets? It may be even easier! 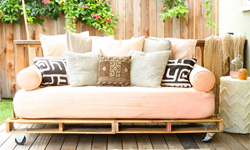 Make a futon couch to rest: Simply place perpendicularly two pallets together, side by side, add some wheels under them for easy displacement, and put over the estructure a futon matress, and voila! you have your own pallet sofa. If you want to take a look for another cool sofa for the garden visit this link.